Dr Beresford does not use appliance brand names as a marketing ploy because there are a multitude of appliances, systems and techniques available today. The most appropriate appliances are selected for each individual case with efficiency, patients desires and the less conspicuous being of primary importance. 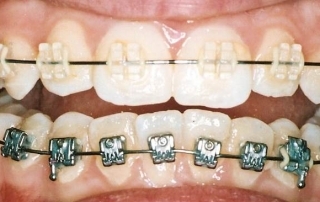 Teeth can be straightened at any age using bonded orthodontic brackets, wires and elastics. Tooth coloured ceramic brackets for upper front teeth. Sometimes the brackets can be invisible. We also offer ‘instant orthodontics’ using veneers. Only 2 or 3 appointments. The braces do not hurt when they are first fixed to the teeth. There is some discomfort for the first seven to ten days and patients gradually get accustomed to them. There will be some mild discomfort after an activation appointment. After some time certain hard foods may be challenging. Orthodontics is the treatment of the irregularities of teeth (especially alignment and “bite”) including the use of braces and other fixed and removable appliances and controlling various aspects of facial growth (dentofacial orthopaedics) and to influence the shape and development of the jaw. There are many types of braces ranging from simple wires only inside the teeth to fixed brackets inside and outside the teeth, clear plastic aligners and removable plastic appliances.